The earth's vast network of oceans support millions of marine animals. Among them are carnivores who eat the flesh of other animals, omnivores who eat a combination of flesh and plant matter and herbivores who are adapted to eat only plant matter. Marine herbivores are found within four groups of species in the animal kingdom -- invertebrates, fish, reptiles and mammals -- and include zooplankton, mollusks, the green sea turtle, the marine iguana and some fish species. Manatees and dugongs are the only herbivores among marine mammals. Invertebrates, animals without backbones, make up 97 percent of all species alive today, or 25 of the 26 phyla into which the animal kingdom is divided. The majority are carnivores and omnivores, but a relatively small number are herbivores, such as some sea snails -- the black-footed paua, top shell snails, limpets, turban shells, abalones and conch -- sea hares and sea cucumbers who graze on algae, seaweed and other plants. Zooplankton are tiny animals that drift through the depths feasting on equally mobile little plants called phytoplankton. Many of these mysterious and fascinating underwater creatures live in shimmering, iridescent shells that have commercial value as ornaments and jewelry; many are considered a delicacy to seafood lovers around the world. The oceans are home to millions of fish, a conglomeration of thousands of species that fall into three classes as distinct from one another as are reptiles from mammals. Within this enormous population of cold-blooded animals that breathe through gills are a group of herbivores, such as yellow tangs, blennies and angelfish that thrive on algae and other plant matter. Without them the world's tropical reefs are compromised, as already seen in the Western Atlantic, because algae competes with coral and invertebrates such as sea urchins. The parrot fish is one of the most striking species in the tropical reefs -- their green, blue, yellow, red and pink colors mimicking that of their namesake. Some of the more diminutive members of herbivorous tropical fish, such as various species of sturgeon fish and pygmy angelfish, are wild caught or bred in captivity to inhabit aquariums around the world, prized for their beauty, the tranquility they inspire and the role they fulfill by cleaning the tank of algae. Reptiles form only a small part of the ocean's animal life, even fewer are herbivorous reptiles. Among them, the endangered green sea turtle, so called for the color of its skin, is mainly carnivorous upon hatching, but progressively changes to a vegetarian diet as it grows. As an adult, it is the only sea turtle that is completely herbivorous, its finely serrated jaws well adapted to eating sea grasses and algae. The largest green sea turtle collected was 871 pounds, but they are normally between 150 and 410 pounds and are about 4 feet long. Like all other sea turtles they have non-retracting heads. Migrating up to 1,300 miles, green sea turtles range along the coasts of the Atlantic Ocean, from their Ascension Island nesting grounds in the middle of the South Atlantic to their Brazilian coast feeding grounds. The marine iguana, found only in the Galapagos Islands, is a perfect example of the metaphorical saying, "You can't judge a book by its cover." Once described as hideous by the father of evolutionary biology, Charles Darwin, this fierce-looking lizard with its smashed-in face, white crown of encrusted salt and spiky dorsal scales is a gentle herbivore with amazing ecological adaptations. 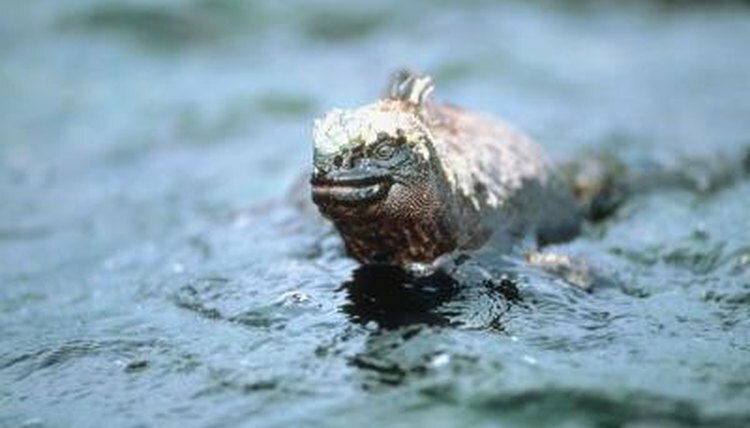 Unlike all other iguanas, it lives in a marine environment and feeds exclusively on seaweed and algae it scrapes off rocks with its razor-sharp teeth. Ranging from 4 to 5 feet long, its average lifespan in the wild is 5 to 12 years. The marine iguana's population has spread throughout the archipelagos where it is protected, however, some mortality results from non-native feral cats, dogs and rats that prey upon the lizard's eggs and young. Manatees, often called sea cows, are voracious herbivores who eat up to one-tenth of their massive body weight every 24 hours. Dining exclusively on water grasses, weeds and algae, these gentle giants are graceful swimmers despite their bulk; they weigh up to 1,300 pounds and grow to 13 feet long. Manatees never leave the water, but need to breathe air at the surface. The manatee population has declined due to hunting pressure for their oil, bones and hides, and they are now endangered, and protected in the waters they inhabit along the coasts and estuaries of Florida, Central America and the West Indian islands. If left undisturbed, manatees can live up to 40 years in the wild. Dugongs are closely related to manatees, but somewhat smaller; they weigh up to 1,100 pounds and grow to 10 feet long. They are distinguished from manatees by their fluked, horizontal, whale-like tail which they sometimes stand on to breathe air at the water's surface. Like manatees, they are herbivores and root for water grasses day and night; they are also an endangered species. Often observed alone or in pairs, dugongs are sometimes seen in herds of up to 100. Distributed throughout the western Pacific, Indian Ocean and the Red Sea, the docile dugong can live up to 70 years in the wild.